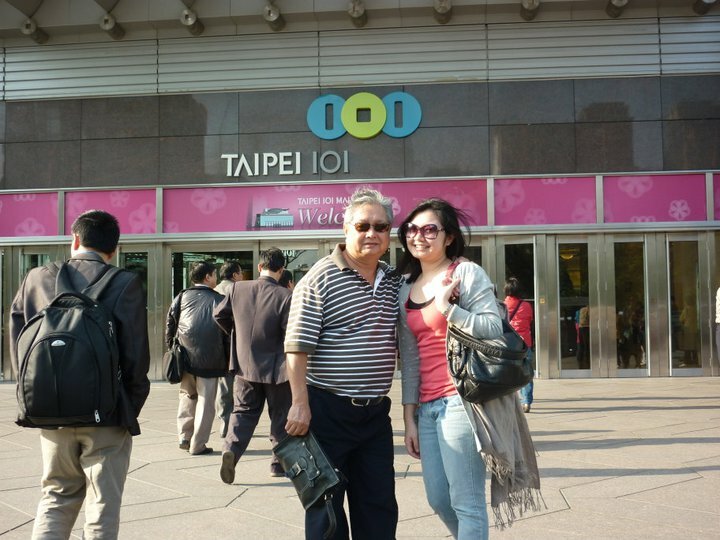 Papa in his recent trip to Taipei. I love how carefree and youthful he looks in this picture. 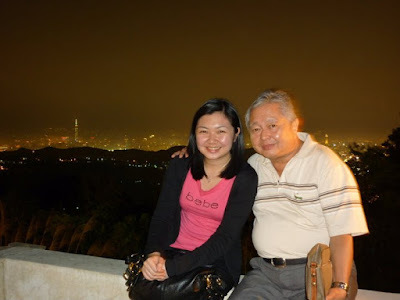 Capped off a beautiful night at the Yang Ming Mountain with Papa's "bebe." Earlier this night I had one of those talks with my dad. After putting down the phone, I realized how grown up I have become, but then deep inside I still feel like a silly little girl who cries each time she gets fed up, stressed out, and does not know what to do. It was just so comforting to hear my dad speak to me about his worries. Those things he never told me before. It was also enlightening at the same time as he had directed me onto which path I should take and to be sure of the decisions I make. My heart finally sank when I heard him say he knows we will not see each other often as we want to, but I felt at ease because he is certain that I'm on the right track. There are so many decisions I have made in the past. I don't know if they were right or they were wrong. All I know is that from all those decisions, I was able to get to where I am now. It has always been one of the daunting tasks to do- deciding. I turn to my rosaries to keep me company and take away my fears. I have no idea where everything will lead. Try to break open my head now and you will definitely see thought bubbles swimming around: a bubble for thesis, for defense, for graduation, for career, for family, for friends, for God, for all things worth thinking of. Sometimes I do get tired of thinking. I want to snap out of reality and cast myself adrift in a sea of illusions. Daydreaming is fun but I hope it would be considered normal for daydreams to last for hours. But then I would not grow up and know the harsh realities of life if all I keep doing is to lock myself up in a roomful of fantasies. Just few days ago I was warming my hands with a mug of green tea latte in a nice coffee shop along Shida. I was soaking wet from the rain and nothing else could warm my dead tired spirit but a nice matcha. I started daydreaming, accompanied by some soulful jazz, and then suddenly I found myself in tears. That is what happens when you spend so much time alone. You grow weary. Over time I have been unlearning to wallow in self-pity. It is hard but I need to grow up. And I think tonight I just made my dad realize that I'm old enough to decide, but not yet too old for some good advice and guidance. Half of me cannot wait for the new chapter to begin, but the other half is still in denial that two years have come and gone, and that Master's degree I was just aiming for few years back, will now be conferred to me in a few weeks' time. Life is fast. I'm talking to my twenty-two year old self now, and maybe the next thing I know, the forty-year old me would be reading this blog and laughing at all the foolishness of my growing up years. By that time, I hope there would have been a mini me to share the wonderful lessons of life with. These are scattered thoughts in my head before hitting the sack on a Manic Monday.